Best Slow Cooker For 2019 Top Models Compared And Reviewed! →Best Slow Cooker For 2019 Top Models Compared And Reviewed! A slow cooker is one of the most used appliances in the kitchen, especially when those cold winter months come your way, and you are wanting to make stews and soups to keep you warm and full. Most individuals call a slow cooker a crock pot. It is something that just about every one of us uses in our kitchen to cook our meals. Slow cookers are able to cook our meals without having to put a lot of effort into it, and it will end up resulting in delicious food for you and your family to enjoy. If you are looking to serve up the absolute best meal for you and your family, then it is important for you to purchase one of the best slow cookers that you can find in the market. They are convenient pieces of equipment that can be used to cook your meals, and there are so many beneficial aspects for you whenever you use one. Everyone is always looking for delicious, satisfying, quick, and easy meals to make for their families, and a slow cooker gives you the ability to accomplish this goal. Slow Cooker Reviews - Our Top Pick! With the All-Clad SD700450 fully programmable oval-shaped slow cooker, you will be able to leave home and work all day. And when you come back home, dinner will be ready and waiting for you to enjoy. This slow cooker gives you the ability to cook anything you desire, such as breakfast foods, lunch, dinner, soups, stews, and even desserts. It is incredibly easy to use, therefore, it is beneficial for you to make any type of meals that you want, and without a hassle trying to make them. If you are looking to find the perfect slow cooker for your home and kitchen, and get the best meals out of it, then this is the perfect slow cooker for you to use. The All-Clad SD700450 slow cooker is a 6.5 quart that has a removable black insert that is made out of ceramic, therefore, you are able to cook a large meal for a big crowd, and you can deliver it right to your table for everyone to fill their plates with a delicious, hot, and freshly made meal. You can cook any meal at any time of the day because it has a 26 hour cooking time, so it is able to fit into any type of schedule. It is easily programmable for anyone to be able to use, and it helps you to find the perfect programs for you to cook your dinner with. 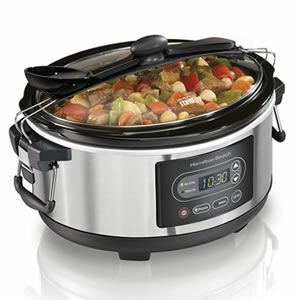 The Hamilton Beach 33473 programmable slow cooker is one of the best ones that you can purchase on the market. It has so many beneficial aspects to this slow cooker, and it will be able to give you the most delicious and perfect meals each and every time that you use it. There are so many flexible options that come with this slow cooker, and it gives you the control that you want, and need when it comes to the temperature and the meals that you cook inside of it. The times, that you have to choose from, can be chosen from anywhere between 30 minutes, all the way up to 18 hours, That is a lot of cooking time, making it even more beneficial for you to choose. When you need a slow cooker that is going to deliver your meals on time, and hot and ready, then the Hamilton Beach 33473 the programmable slow cooker is the one for you to use. It has been specifically designed to create an even cooking around your meal, and the wrap around feature, that it comes equipped with, will be sure to distribute the heat evenly and keep it at the perfect temperature, without even having to stir it through the cooking process. This slow cooker switches to warm once your meal time has finished,and the insert and lid are easily removable, making it easier to clean after you have eaten your meal. The lid is made of glass, and it has the ability to lock down tightly to the slow cooker. This helps to keep condensation from building up around the edges, which makes easy cleanup. It also keeps the flavor of the food locked inside of it, and keeps the contents inside from spilling out of it. The stoneware that is built into it, makes it easy to clean in the dishwasher, and keeps food from becoming stuck to the sides of it. There are so many amazing qualities about this slow cooker, and they are the reason as to why so many customers have been satisfied with making this slow cooker the appliance of choice when it comes to cooking their meals. It doesn't matter if you are using it for big gatherings, or as a daily use. The Kitchen Aid KSC66222SS slow cooker is the one that is going to give you the satisfactory results that you need and desire. There are so many of us who are looking to find the perfect slow cooker, that is going to give us the most delicious and healthy meals that we are looking to consume. This means that you have to do a lot of research in finding the right slow cooker that is perfect for you This specific slow cooker is able to give you everything that you need to make your family's meal, or your guests at a part, the best food that you could ever cook and serve. There are so many beneficial aspects to this slow cooker that give it the high recommendations that it has received, and it isn't hard to see why it has been rated high.The double-sided hinged lid makes it easy for you to be able to open up the slow cooker to check on your food or stir your food, as it is in the process of cooking. Another amazing aspect of this type of lid is that you can rest assured in knowing that the locks on the lid will keep your food from spilling out. It makes taking the food out easily without having to remove the lid entirely. The lid stays on the ceramic crock pot, and as you need the food, simply open one side and serve. Then the lid will lock back to keep the freshness and the flavor trapped inside of it. Whether you are looking to cook your family a good meal, or you are needing to make appetizers or a meal for a party with guests, the Hamilton Beach 33957 programmable slow cooker is the appliance that is going to get the job done properly for you. It has a unique clip that locks onto the top of it, therefore, the food is not able to spill out of it and make a mess in your vehicle. The oval shape has been specifically designed to be able to fit meat anywhere from 3 lbs to 5 lbs, giving you plenty of space to cook what it is that you need to cook. You need to be sure that you have the right slow cooker that is going to cook the amount of food that you want, that will produce hot and ready meals whenever you are in need of them, and that is going to satisfy your food needs. There are so many different aspects of this slow cooker, that is going to bring out the best results that you desire since it is one of the high quality slow cookers that can be found on the market.It was uniquely designed with a clip top lid, and this makes it spill resistant and it helps to lock in the flavor of your food. When you are making something in your slow cooker that you are going to bring to an event or a part, the lid makes it easy to transport. You can feel the relief in knowing that your food is going to make the trip safe and efficiently. You have 2 options, that you can choose from, that makes your cooking automatic and easy to accomplish. You will have the ability to transport this slow cooker from different spots in your kitchen, or even if you are traveling with it, the handles are easy to grip and hold on to. It is easy to use when you are cooking in it, and it is also incredibly easy to clean, which makes cooking and dinner time easy to do. The Focus Electrics West Blend 84905 slow cooker makes preparing meals an easier task to accomplish. If you are one of those individuals who is looking to find the top class slow cooker, then this is the perfect slow cooker for you to decide on. All you have to do is simply put together all of the ingredients, set the temperature and the timer, and then wait for the meal to finish cooking so you can enjoy a hot and delicious meal. You can use this slow cooker to make a variety of meals for your family to enjoy, or to make your gathering of guests a delicious appetizer or meal for a party. It doesn't matter what you use it for, it gives you the convenience of cooking a delicious and healthy meal for you and those who you are sharing your food with. There are several beneficial aspects to owning and using one of these slow cookers, and one of the additional bonuses of using this slow cooker is the fact that the base of it can be used as a non-stick mini griddle. It holds up to 5-quarts which make it convenient for making meals, or even for entertaining. No matter what you are using it for, you will be satisfied with the results of this slow cooker. The lid is included with this slow cooker, so you can be sure that the nutrients, in your food, remain inside of it. It will keep your food hot and ready to be served once the cooking time is done. It has temperature control for you to set the timer on to the specific time needed. An amazing aspect to this slow cooker is the fact that it is Oven-safe, dishwasher-safe, and even freezer-safe. This makes your cooking, and the storage of your food, much easier to accomplish. These amazing features give you everything that you are looking for when it comes to cooking, storage, and clean up. The slow cooker is designed out of metal, and this is what gives it a more flexibility when it comes to the use of this appliance. The dish washing safe feature gives you an easier cleanup time. It is one of the high quality slow cookers that you can find in the market, and it isn't hard to see why it has been labeled as one of the best from the several satisfied customers who have purchased and used it. The Crock Pot SCV800-B Slow Cooker is convenient for those who live a hectic and busy daily schedule, and want to have a hot and delicious meal by the time they get home. You will be able to put your meal in it to cook in the morning before you head out, and by the time you make it back home. You will have a healthy and satisfying meal ready and be waiting for you to eat. This slow cooker is perfect for making large meals whether it is for you and your family, or you are having a large party or entertaining guests in your home. This is one of the best slow cookers that you can find in the market, and there are so many customers who have found what they were looking for when they decided to make this cooker the option of their choice. You will not be disappointed with the results that you will end up with once you use this crock pot, and you will be able to enjoy the best meals every time that you use it. This slow cooker is an 8-quart sized appliance, and this gives you plenty of room to make a large entree for your dinner, or even if you are looking to have a gathering at your home. As you go about your day, it will cook your meal for you, and you will end up with a nutritious meal and plenty of left overs to enjoy later. You have 3 different heating options that include high, low, and warm. The fact that it is made out of stoneware, automatically indicates that the clean up time is going to be an easy one. Once you have finished cooking your meal, in the time you need it cooked, you can then switch it over to warm to keep your meal warm until you are ready to eat it. The glass lid, that it comes equipped with, gives you the ability to keep an eye on your food, make sure that it is cooking properly. It keeps the food warm and prevents from letting the flavor and nutrients from leaking out. To keep your food fresh, the lid also prevents the heat from escaping while it is cooking. It has been uniquely designed with gripping handles. When you have a busy lifestyle, you don't always seem to be able to find the time to cook a decent meal for you or your family. Well, with the Cuisinart MSC-400 3-in-I Slow Cooker, you will be able to bring a delicious and nutritious one-pot meal to the dinner table every night. There are so many possibilities and ideas that you could use for dinner when you cook in this slow cooker and they will bring your family the meals that they deserve. From Browning specific meats that you desire, sauteing delicious vegetables, and being able to make slow cooker meals to the dinner table, is what every family looks for when they are going about their day-to-day lifestyle. This slow cooker will cook your meal through the day time, and give you the perfect meal that you are looking for by the time that you make it back home with your family. You can even make delicious desserts in this slow cooker as well. and that is something that everyone will look forward to. This 4-quart cooking pot is the perfect size for a medium sized family, and the non-stick aluminum makes it easy to clean up once you have finished eating your meal. It is BPA free, which is something that everyone looks for, and the glass lid, that it comes equipped with, gives you the ability to view your food while it cooks and lock in the flavor that you desire to soak into the food that you are preparing. The cool-touch handles give you the right comfortable grip and safe handling gives it the right kind of portability that you need. There are cooking function buttons that have been created into this slow cooker, and these give you the ability to choose which setting is going to be the best one to use, depending on the meal that you choose to make. You will be able to prepare your meals in a cute and stylish slow cooker with the Disney Pixar Oval slow cooker. All of your favorite Disney characters are all printed onto the sides of this slow cooker, and it gives your kitchen a fun and refreshing look and style when you are using it to cook your meals. It is a large slow cooker, with plenty of space to make a large meal for you and your family to enjoy at the end of the day. There are so many of us who do not have the time to cook a proper meal each and every day, and this slow cooker is able to give you that satisfying meal that you want to sit down to at dinner time. You will be able to make your family feel full and satisfied with the meals that you can produce from this slow cooker. You will be able to make simple entrees such as chili, stews, or soups, as well as, being able to cook whole chickens and bigger meats to fill your family's stomach. With a slow cooker like this one, you will be able to bring the most delicious and healthiest meals that you could ever hope to achieve.The Disney Pixar Oval Slow Cooker is a 7-quart sized crock pot, and this allows you to bring the biggest and excellent tasting foods to you and your family's mouth. The characters on the side of this slow cooker, give you a fun look and a fun feeling to your kitchen as it is cooking the most delicious recipes that you desire. The glass lid allows for you to view your food as it is cooking, and it will keep your food full of the nutrients that you need, while preventing any of them from leaking out. The removable stoneware inner pot allows you to be able to remove it from the outside of the slow cooker, and give you an easier cleanup, and making it dishwasher safe as well. The power cord makes it easy to use and store when you are finished with the slow cooker. The warranty is a beneficial aspect that is added in when you purchase this slow cooker, and you can have this item gift wrapped when you are having it shipped. It is one of the high quality slow cookers that can be found on the market, and there have been so many satisfied customers who have highly recommended this slow cooker to anyone who is looking to bring their family and guests the meals and food that they deserve. 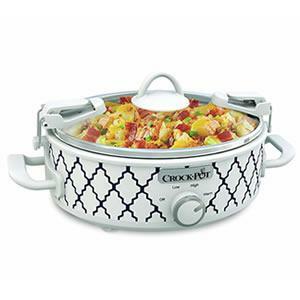 If you are looking for the best slow cooker that is just enough to make a small meal, or appetizers for a party you are hosting, then the Crock Pot SCCPCCM250-BT Mini Casserole Crock Slow Cooker 2.5-Quart is the one for you to look into. Meals like macaroni and cheese, lasagna, and even desserts are perfect for cooking inside of this small slow cooker. It has a locking lid system that allows for you to transport it from your kitchen to your table, or to another place that you might be having a party.It was designed with this portability in mind for you to conveniently use. The lid makes it spill-resistant, and it helps to lock in the flavor of the food, so you can enjoy the most delicious tasting meals that you desire to create. You will be able to go through your busy and daily schedule, as this slow cooker cooks your meals for you, and they will be ready for you and your family when dinner time comes. There are so many amazing aspects to this slow cooker, that gives it the highest ratings that it has received by several satisfied customers. The lid-mounted clips keep it secure to lock in the flavor of your meal, and to keep the heat from exiting the slow cooker. This helps your food to cook faster since the locks are able to keep the lid securely in place. These mounted lid clips also make this slow cooker spill resistant, therefore, if you are looking to travel with food inside of it, you will be able to keep it from spilling over into your vehicle. The stoneware insert makes this slow cooker very easy to clean, as well as, dishwasher-safe. The high and low settings allow for you to be able to choose the desired temperature that you need. There is a keep warm option that can keep your food fresh after it is done the cooking. The power cord makes it easy to store, so when you are finished cooking and cleaning this slow cooker, you can easily put it up and out of the way. The warranty gives you the benefit to be able to take care of any type of issues that you might end up dealing with. If you are sending this item as a gift, you can have it gift-wrapped before having it shipped out. You will find that you will find the satisfaction that you are looking for in the meals that you will create out of this slow cooker. When it comes to finding the right slow cooker, it is important for you to be sure and do plenty of research about them to determine what you should be looking for when you are going through the purchasing process. There are so many different aspects, to a slow cooker, that you need to be sure that you take into consideration before you make your initial decision. There are plenty of things to look for, and learning and understand what all of these are, is what is going to help you to narrow down the best slow cooker for you to own. We will be looking into the different types of things that you should consider before buying a slow cooker. Programmable slow cookers have a built in timer feature that allows for you to choose the cooking time that you prefer for your meal. Most of these types of slow cookers have an automatic switch that will immediately go to the keep warm feature once your cooking timer runs out These slow cookers can even be used manually as well. Mechanical slow cookers can simply be used by turning the dial to the desired temperature that you need to cook your food on. They come with 3 basic settings that include low, medium, and high. You will have to monitor your food, as it cooks, because these slow cookers do not have a programmable timer. There are some of them that come with a 'keep warm' feature, however, most of them do not have this feature, so you will need to turn the appliance off once your food has reached the desired temperature. You will need to be sure that you go over the features of a slow cooker before you purchase one. It is important that you buy a slow cooker that is going to give you the features that you desire to have in this appliance. The features are one of the most important aspects to consider, so you can be sure that you have a slow cooker that you are going to be satisfied with in using and that you are going to get the desired results that you are looking to find. There are several different features that you will have to consider before buying your slow cooker. The capacity of the slow cooker is one of the most incredible features that you will need to focus on the most.This is going to give you the room that you need to be able to cook the size of the meal that you are needing to cook. You can find slow cookers anywhere between a 1.5 and 8.5 quarts. and you will need to base your decision on keeping any spill avers from happening, and under or over-cooking your meals. The experts will tell you to be sure that you fill the slow cooker only about 1/2 or 3/4 of the way full, so you will need to carefully calculate what is going to work the best for you and your family. Determining the types of meals you will be cooking, is what is going to help you decide on the temperature settings you are going to need. The temperature of the slow cooker matters depending on the meal you make. If you are looking to just focus on soups and stews, then you might not need a slow cooker that has high temperatures. However, if you are looking to make meals with thick pieces of meat, then you will definitely need to decide on a slow cooker that has much higher settings. Any slow cooker that you purchase is going to have a removable insert that you can take out to clean. some of these might be ceramic, but most slow cookers have a metal insert Several of them have non-stick coatings and they can even be put on the stove, in the oven, and in the microwave. The shape of the slow cooker is an important feature to consider. Depending on the food you are putting in to your slow cooker, you will need to base this on the shape. You can find slow cookers in shapes such as oval, round, or oblong. If you are looking to cook quite a few roasts in your slow cooker, then you might need to consider getting an oval shaped cooker, because this will help you to fit the meat inside of it. The round and oblong slow cookers are easier for making soups and stews. So, determine what you are going to be making and then go from there on making your decision. You will be able to find slow cooker lids in plastic and glass, and these are beneficial for you, so you are able to view the food through the lid without having to take it off. You will be able to see that the food is cooking properly and that it isn't burning. They help you to keep a close eye on your meal. Cleaning your slow cooker is important to consider, because you are the one that is going to have to clean it when your meal is finished. The insert, and the lid, can be easily removed from the slow cooker, you can soak them if you need to, and then you are able to wash them by hand like any other kitchen item, and you can even put it in the dishwasher as well. The touch pads on these slow cookers are easier for cleaning as well, and this is because you can simply wipe down the touch pad, which you are not able to do buttons or knobs. If you are looking to use a slow cooker, and you want to be able to make the best meals that you can, and have it function the way that you need it to, then there are many tips that you can use to help you use your slow cooker in the best way possible. So, when you are looking for the right tips to follow to properly use your slow cooker, and to keep from damaging your slow cooker. Never use oils, cooking sprays, or any other types of sprays inside of your slow cooker. Even on the lowest of temperatures, these oils burn very easily and this is something that you will want to avoid. The surface of slow cookers are non-stick, therefore, you shouldn't have to use any type of oils inside of it. In conclusion, when it comes to slow cookers, there are so many different aspects that make these appliances perfect additions to make to your kitchen. They are able to give you the perfect meals, cook while you are busy, give you delicious foods, have so many convenient features, and leave you satisfied with the meals that you are able to create. There are several different types of slow cookers that you will be able to find in the market, however, the ones that are listed in this article, are considered to be the best slow cookers, with the high ratings and highly recommended. When you are looking to own and use a slow cooker, you will be able to find what you desire in these amazing slow cookers. So buy yours today and let us know!